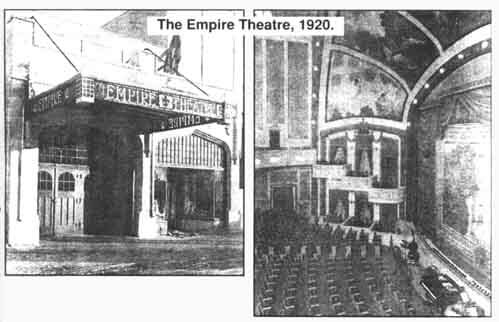 In 1906, the Empire Theatre opened as a venue for vaudeville. It was a wood frame building, located on the northwest corner of what was then McDougall Avenue (100th Street) and Cristabelle Street (101st A Avenue) – opposite today’s Westin Hotel. Three years later, the original building was abandoned and subsequently demolished. The Edmonton Opera House, also constructed in 1906, became the new home for the Empire on 103rd Street north of Jasper Avenue.